Coming back from any vacation always leaves me simultaneously underwhelmed and overwhelmed. I feel underwhelmed because my daily routine is nowhere near as exciting as free-spiriting it around a new place, and I feel overwhelmed because I have mounds of laundry to attend to, an empty fridge to fill and people to reschedule plans with. But these are "everyday problems." While hanging out in Vegas (more on that to come) I was immune to the news cycle for a couple of days and returned to a world that is full of murder, cannibalism, war and wide-spread unemployment. While it feels frivolous sometimes to blog about shampoo when the world is falling apart, sometimes we all need a break from the negativity. 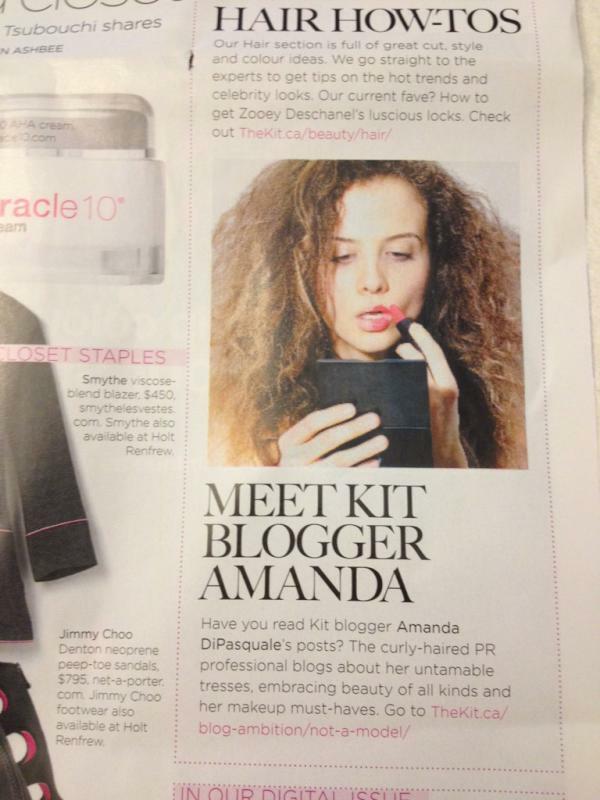 Today I was featured in the print edition of The Kit in their Toronto Star issue (photo above) as a Kit blogger. I was flattered to have my own little bio in my local city newspaper and it brightened up my day. Have a pint…on your hair? As the warmer weather brings the familiarity of rickety patios and tall, cool glasses of beer, one would never think that pouring that mixture on one’s head could result in…better locks. I’m always on the lookout for a shampoo that will help manage my unruly mane, while also steering away from anything that smells too strong or fragrant. I’m not a fan of anything that feels like I’ve dipped my head in a bouquet of flowers or potpourri. The shampoo is made with organic vegan stout from a local brewery. Apparently the stout has protein to give your strands a bit of weight and shine, especially when the weather is a bit sticky out. I love how it smells a bit like lemon, and it definitely doesn’t feel like your dousing your hair in a pint. The yeast from the beer is also good for the scalp and the lemon juice cleanses the hair without stripping it dry. There are also three different sizes, so you can try it out without making the commitment. Just don’t fall down in the shower. Congrats Amanda ! This is amazing ! Congrats on being in the Toronto Star! So proud of you!